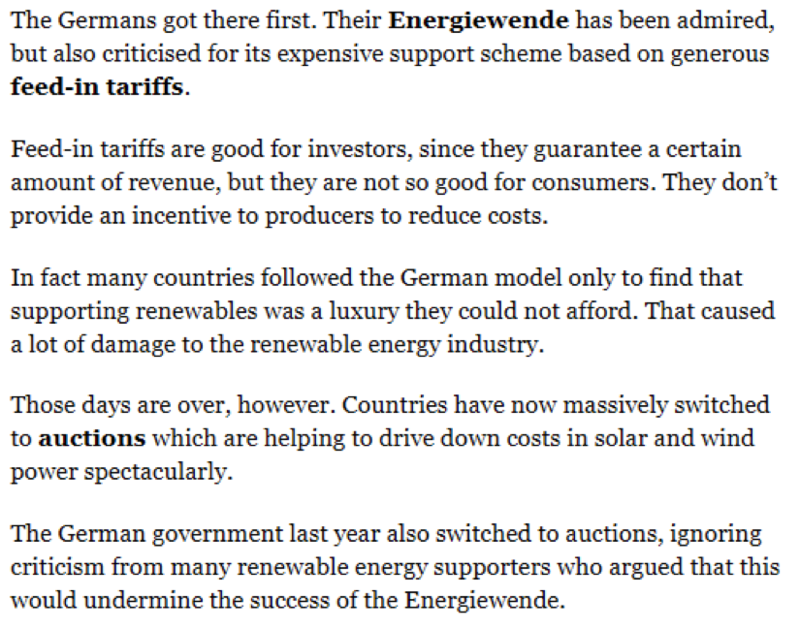 Numerous commentators continue to praise Germany for switching from feed-in tariffs to auctions. The screenshot below is from an Energy Post newsletter from this summer. A lot of it is wrong. Feed-in tariffs guarantee a price, not revenue; the amount of power generated is not set by law. And it’s amazing that we hear that FITs “don’t provide an incentive” to lower costs. 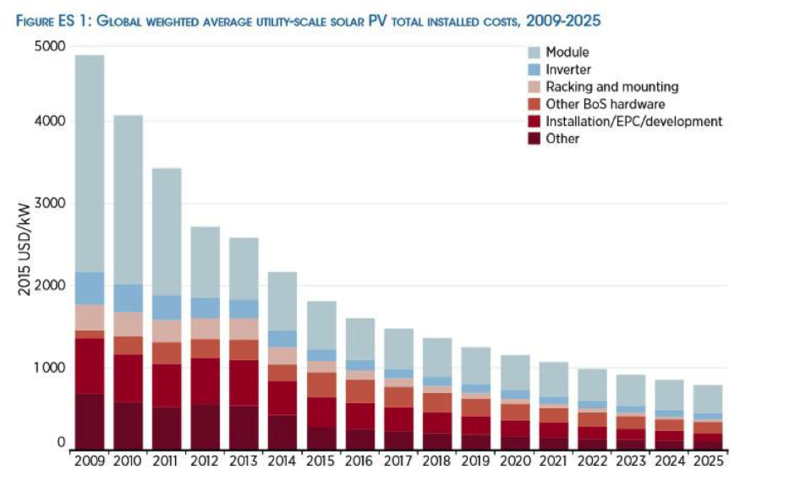 In the chart below, FITs accounted for almost all of the solar installed worldwide from 2014 until 2015, and prices fell by two thirds. Are auctions at least driving down costs faster? They do keep costs low in one respect: by shutting out expensive projects. But they can also drive up costs because losing bids lead to losses that firms price in for future bids. But the main effect is that prices for the future are reported as though they applied today. 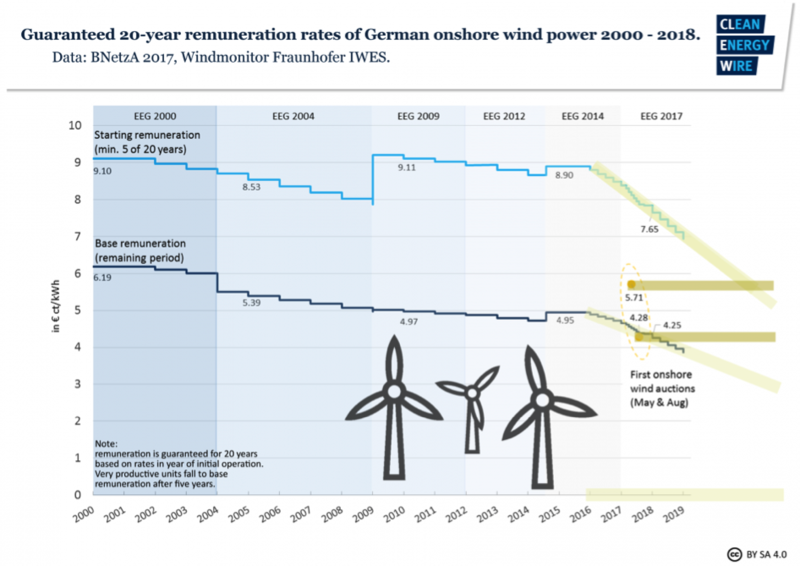 Take a look at the chart below from Clean Energy Wire (a site you should follow if you are interested in the Energiewende). To understand the chart, we need to know that the top line represents a higher FIT for the first five years at least, followed by a lower rate for the remaining maximum of 15 years (20 years total in any case). If a site has poor wind conditions, it stays at the higher rate longer with the aim of providing a similar profit margin for all investors. Note as well that the FITs in both lines have plummeted since 2014; if that’s not an incentive to lower cost, I don’t know what is. The recent wind auctions (the yellow dots) are clearly lower than the top line but unremarkable compared to current FITs. But in reality, almost all of those projects have 4 and a half years to be built. The prices thus reflect the future, whereas FITs apply when the project is connected to the grid – today, so to speak. Adjusted for the effect, the comparison looks significantly different, as the chart below shows (my markups). Assuming that the trend in FITs from 2014 continues (which, to be fair, we cannot know for certain), the auction outcomes are hardly remarkable at all. In fact, the price of 5.71 cents per kWh is even higher than the upfront bonus FIT that could be available by then. When I contacted Energy Post about this matter, the editor ceded no ground: “Why did Germany replace FITs with auctions if not to bring down costs?” Answer: the German government switched policies to keep wind, solar, and biomass from growing faster than expected. Cost was always the stated reason; who could be against keeping costs in check? But a government cannot simply say they want to slow down new builds – at least, not in Germany. Yet, that is the main result. The solar auctions have been successful in terms of cost and realization rates: the winning bids are generally finished on time, which is not the case worldwide – as this Energy Post article explains. But it also writes, “no cooperative was visibly successful in any of the PV auctions over the last two years.” The wind coops that swept up the first two rounds of auctions are considered fake; not even German citizen energy groups want that policy setup to continue. The recent biogas auction also led to a sobering result: less than a quarter of the already paltry amount tendered will be built for a lack of interest (in German). The minimum price will simply too low. But the sector is not complaining; FITs were also set too low. The government decided years ago that too little sustainable biomass is left, so these firms are happy to get whatever options they can. What about the last claim from Energy Post’s newsletter above: the switch to auctions won’t endanger the Energiewende’s success? I’m not so sure. German citizens have not complained about the cost impact much because they cherish the opportunity to make their own energy. Increasingly, however, they are being told, sorry, you can’t build because the utility you dislike – in 2014, 80% of German customers surveyed said they wanted to be “less reliant” on their provider – can generate this power for 0.5 cents less. People in rural areas are especially shut out because they can build lots of solar, wind and biomass. To put this into American terms, country folk are not saying “Walmart is too expensive,” but rather “there’s nothing here but Walmart.” FITs gave them economic options they now lack. In other countries, citizens dislike wind farms because so many are built by big firms. Why do we think that will be any different in Germany? Answer: Mainly pressure from the EU. Previous PostWhat do deniers get out of their denial?